What is Wobbly Hedgehog Syndrome? Wobbly Hedgehog Syndrome (WHS) is a degenerative disease affects the nervous system of both African pygmy (Alterix sp) and European (Erinaceus europaeus) hedgehogs. Oftentimes a general diagnosis of “Wobblers” or WHS is given when animals present neurological signs or symptoms. True Wobbly Hedgehog Syndrome is only diagnosable by a necropsy and pathological examination of brain and spine material. It is important to rule out the possibility of injuries, disease, or illness that could cause similar symptoms to ensure proper treatment is provided. If there is any concern about your hedgehogs’ health, consult a knowledgeable veterinarian. There are many things that a veterinarian should rule out before your hedgehog is believed to have Wobbly Hedgehog Syndrome. Many similar conditions can be treated. A wobbly gait or appearing to tremble while standing still. Difficulty standing and regularly falling to one side. One of the earliest signs of WHS is that the hedgehog is unable to close its hood (visor used to protect the eyes). Graesser D, Spraker TR, Dressen P, et al. Wobbly hedgehog syndrome in African pygmy hedgehogs. J Exotic Pet Med. 2006;15:59–65. HOWEVER, these symptoms can also be of other origins (see What is NOT WHS below). A majority of WHS cases exhibit a gradual onset but some cases progress relatively rapidly. Due to the commonality and overlap of these symptoms many people may sometimes confuse other diseases, disorders, or illnesses for WHS. Please read our Hibernation and Estivation and Temperature Requirementsarticles for more information regarding false hibernation. Bone marrow, cortex, and periosteum; surrounding soft tissues may also be affected. Caused by bacteria in the blood stream. There are numerous theories about the causes behind WHS, which will be outlined below (none of these are proven, though there is some scientific proof behind some). Others believe that WHS is triggered by a mutated allele (form of a gene) and that TWO copies are needed to acquire the disease. All offspring would not inherit the mutated allele should the parent happen to develop WHS. However, many experts either fail to support the above theory in their writings and there is little evidence a recessive gene is at work. Familial connections may have more to do with infection and viral latency than a recessive or mutant gene. Infections may be fungal, viral, or bacterial in nature. A weakened immune system allows an infectious agent to thrive. Demyelinating diseases are usually caused by viruses (Hesselink) as in the case of multiple sclerosis. However, no virus has been linked to WHS. In more recent years, diet has become a controversy due to a lack of vitamins, minerals or other nutrients in the food. Many breeders currently still disagree on the diet; however, most breeders agree that a hedgehog should be fed a high quality diet (see Diet section for more on hedgehog diet). Toxins in the environment can also cause similar brain lesions. Allergens can also be a source of severe stress to the body. This leads some speculation to the chicken and egg question: which came first, the chicken or the egg? Which comes first, WHS or the other malady? Damage or degeneration of the white matter of the brain. Leukoencephalopathy is clinical sign in numerous disorders of both animals and humans, therefore does not indicate a specific relationship to an injury, disease or disorder. Some possible causes of leukoencephalopathy are toxins, radiation, autoimmunity, infectious agents, and numerous genetic conditions. Even within “genetic” causes of leukoencephalopathies ,there are metabolic disorders (defects in the genes or enzymes involved in metabolic pathways), dysmyelinating diseases (defects within the genes that code for the structural proteins of myelin), lysosomal storage diseases, and others. There are over 40 documented lysosomal storage diseases alone. Air pockets are present in the brain and spinal cord. There is demyelination and/or axonal degeneration confined to the central nervous system. According to Dr. Garner and Grasser, 2006 clear inclusions are seen routinely in the renal tubular epithelial cells of affected animals, and the significance of these relative to the CNS lesions is being investigated. Most WHS cases are also reported to have other critical illnesses present at the time of necropsy that could cause death in and of itself. Therefore, WHS be not the main cause of death even though the hedgehog may lesions consistent with WHS. Hedgehogs are often described as dying from WHS when in fact they did not have brain lesions consistent with multifocal leukoencephalopathy but simply had a wobbly gait when they passed or at some point during their illness. Most breeders do not consider an animal as having confirmed WHS without a necropsy report confirming the diagnosis. There is currently NO cure however high quality of life can be maintained for many moths after initial symptoms appear. Ensure your hedgehog has the highest quality diet possible. Some hedgehogs are able to eat on their own for quite some time but as the disease progresses hand feeding will become necessary. Be certain the ailing hedgehog has enough fluids and that your hedgehog is eliminating properly. Make sure that your hedgehog is warm. Homeopathic remedies are also a possibility. Laura used an alternative treatment plan for her Tommy and has given us permission to use an article posted on her website. We appreciate her dedication to helping sick hedgehogs. Syringe feeding is necessary when hedgehogs can no longer eat without assistance. Euthanasia is a recommend when quality of life cannot be maintained. We believe that learning more about WHS will help others in the future. A necropsy (autopsy) should be discussed with your veterinarian and plans need to be made to prepare for when your hedgehog passes. Again, we appreciate Laura allowing us to use her articles that are article posted on her website. All dietary changes should be made under the direct supervision of your veterinarian. Please not that change in diet can cause stomach upset and diarrhea. Ensure that all food is high quality with little added ingredients. Offer live insects from the pet store. Feeding fresh fruits and vegetables is often recommended by hedgehog enthusiasts. However according to The Journal of Nutrition hedgehogs are unable to use plant matter as fiber. They have been designed with the digestive enzyme chitinase and have the ability to utilize the exoskeleton of insects (the source of chitin) as their fiber source. Plain backed chicken or turkey breast. Some cat food brands have canned, all natural 100% cooked chicken. Owners who have cared for ailing hedgehogs have used supplements on a daily or bi-weekly basis. Time has shown that any breeder can have a case of WHS show up in their herd at any given time. No breeder is immune. Accurate record keeping is important for any breeding program. Breeders must retain records concerning all confirmed cases of Wobbly Hedgehog Syndromes that are related to their herd. Breeders have a wide range of opinions as to how to change or alter their breeding program if a case of Wobbly Hedgehog Syndrome is confirmed in their lines. Some breeders choose to stay clear of any lineage that has confirmed cases. Doing so is nearly impossible but if it is viral infection, a latent virus can be transmitted on a chromosome or a virus can be shed as a sexually transmitted disease. In this case staying away from all WHS lineage is probably the best way of preventing transmission. However, WHS may be a latent virus that only effects hedgies that are immunocompromised from another disease that the hedgehog would have died from without having Wobbly Hedgehog Syndrome. WHS is not an epidemic. In some regard, perhaps survival of the fittest is keeping WHS in check all on its own. Most veterinary experts agree that it is unwise to retire or cull all ancestors, siblings, and offspring from a breeding program if a WHS case is identified. By eliminating all familiar ancestry from a breeding colony, the colony will have limited genetic diversity, which will become a determinate to breeding programs. Each breeder must decide how a positive Wobbly Hedgehog Syndrome case somewhere in their lines will affect their breeding program. The cause and/or transmission of WHS is still unknown so there are few guidelines to evaluate a “good” or “bad” breeding program. Nakata, M., Miwa, Y., Itou, T., Uchida, K., Nakayama, H., and Sakai, T. 2011. Astrocytoma in an African hedgehog (Atelerix albivenris): suspected wobbly hedgehog syndrome. Journal of Veterinary Medical Science. Lawn RM, Boonmark NW, Schwartz K, et al. The recurring evolution of lipoprotein(a): insights from cloning of hedgehog apolipoprotein(a). J Biol Chem. 1995;270:24004–24009. Palmer AC, Blakemore WF, Franklin RJ, et al. Paralysis is hedgehogs (Erinaceus europaeus) associated with demyelination. Vet Rec. 1998;153:550–552. Graesser D, Dressen P, Spraker TR, et al. Wobbly hedgehog syndrome: possibly a progressive lower motor neuronopathy. Proc Annu Conf Amer Assoc Vet Lab Diagn. 2001;44:82. Graesser D, Spraker TR, Gavier-Widen D. Wobbly hedgehog syndrome in African pygmy and European hedgehogs. Proc Eur Hedgehog Res Group. 2004;6:5. How common is this condition in general and how often do you see it in your animals? This is a HIGHLY debated topic among breeders and owners. I’m on the very conservative side. I’m a researchaholic and I study and research and talk to veterinarians and I have many vet friends. The general belief of my resources is that true WHS is a very low percentage of hedgehogs. There are MANY hedgehogs who are assumed to have WHS that in fact have other problems. Many problems that have the same signs and symptoms are treatable. My stance (through my research) is that you must rule out other possibilities before assuming WHS. I kind of compare it to human vomiting. Just because you vomit doesn’t mean you have stomach cancer. You could have ridden a ride at the fair too many times, have a virus, have food poisoning, have the flue, etc. The root of the problem is most important. Also, the cause of WHS is under great scrutiny. The necropsy reports that I have seen also have serious other conditions that in themselves could be fatal. Many believe that a weekend immune system opens the door for WHS. We use a food that higher folic acid than other foods. Folic build the nervous system (brain, spinal cord, nerves) as well as build all cells to protect at cell damage. I believe that NO herd is immune but each breeder should track confirmed WHS cases and those who may not have a necropsy but all other similar disease and/or problems have been ruled out by a veterinarian. Some believe that good hedgehog breeders can prevent WHS in their herd by breeding “clean” or WHS free lines. A professionally maintained hedgehog registry of pet and breeding animals would allow breeders to track animals with confirmed cases of WHS and other illnesses. Unfortunately, hedgehog enthusiasts are so passionate about their animals that “hedgehog politics” have prevented a consolidated data program. The following information was written by written by Laura Ledet who has graciously given us permission to use the following information directly from her website. DAY ONE: Bellis Perennis 30c; one tab dissolved in 1/2 tsp. water, 4 drops given orally via eye dropper. Repeat dose 3 times; morning, noon and night. DAY TWO: Arnica Montana 30C; one tab dissolved in 1/2 tsp. water, given orally via eye dropper. 15 minutes later massage Star of Bethlehem Flower Essence down entire spinal column and on top of the head. One hour later, give one tab Hypericum Perforatum 30X dissolved in 1/2 tsp. water orally via eye dropper. DAY THREE: Hypericum Perforatum 30X; one tab dissolved in 1/2 tsp. water. Repeat this dosage 4 times throughout the day. Star of Bethlehem; 2 drops in drinking water. DAY FIVE: Hypericum Perforatum 30C; one tab dissolved in 1/2 tsp. water, taken orally, repeating this dose 4 times throughout the day. One tab Mag/Phos 6X; dissolved in 1/2 tsp. water administered 1/2 hour after the hypericum. Star of Bethlehem; message onto head and down entire spinal column. DAY SIX: Hypericum Perforatum; one tab, 1 dose, as prepared above. Mag/Phos 6X; one tab, 1 dose as above. Star of Bethlehem; message on top of head and down spinal column. DAY SEVEN: Mag/Phos 6X; one tab, 1 dose, prepared as above. Star of Bethlehem; message on top of head and down spinal column. *Check with your local health food stores for homeopathic supplies. Tommy was also on a regimen of daily B-complex injections for 10 days, shortly after he became ill, and was given mega-C vitamin drops daily thereafter. Please make sure your Vet gasses your hedgehog BEFORE injecting the euthanasia drug into him. This way, your little one will be peacefully sleeping when the needle is inserted into his heart or abdomen. No Vet will ever convince me that it is anything less then cruel to give this injection to a animal who is awake and able to feel pain of that needle. Lastly, I always hold my animals as they leave this world. Do not let your Vet tell you that you cannot go back with them to put your pet to sleep. If they will not allow this, go elsewhere if at all possible. I would strongly urge you to find out what your Vets policies are regarding this BEFORE anything happens. To speak softly to my animals during their last moments on this earth is my last gift to them. No one should have to die in the hands of strangers. By saying this you might be thinking that I find euthanasia an easy experience to get through. Trust me, it isn’t…but it is what I feel I owe the animal companions who have shared my life, and my love. The tears always come later, and it never gets any easier to say goodbye. One way to gain something positive from the experience of caring for a hedgehog with WHS is to schedule a necropsy (autopsy) to determine if he or she did indeed have WHS. There is a strong genetic component to this disease, and any data we can collect to track it may someday help to stop it. 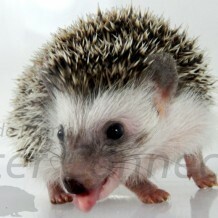 At the very least, if you have access to your hedgehog’s breeder, you can inform the breeder of the necropsy results and hopefully encourage the cessation of further breeding from that hedgehog’s bloodlines. The breeder can then notify the owners of any other offspring from that line. If you simply want an answer to the question, “Did my hedgehog have WHS?” any veterinary pathologist can answer that question for you. Please discuss this in advance with your veterinarian; your veterinarian should ask a pathologist to examine the histopathology of the brain and spinal cord for lesions, as well as any other organs that might have contributed to the pathology of this animal. “Leukoencephalopathy”: Damage to the myelin that forms the white matter in the brain. “Demyelination”: Loss of myelin, which is the covering of the nerves that allows for smooth and rapid transmission of impulses. “Axonal Degeneration”: Evidence that axons of nerve cells have been damaged or destroyed. “Neuropathy”: Disease that affects the nerves. It is imperative that the tissues be fresh. This is why your veterinarian should know that you plan to have a necropsy done, and should prepare the tissues for the pathologist as soon as possible after your hedgehog passes away. IMPORTANT NOTE: If your hedgehog should die at home, do NOT put the body in the freezer! Ice crystals will form inside the cells and interfere with the histopathology results. Wrap the body in paper towels, place in a loosely closed plastic bag, and store in the refrigerator until you can take the body to your veterinarian or pack it for immediate shipping. The price range for a necropsy is usually between $50-$150, depending on your individual veterinarian and the pathology lab used.